I did it! 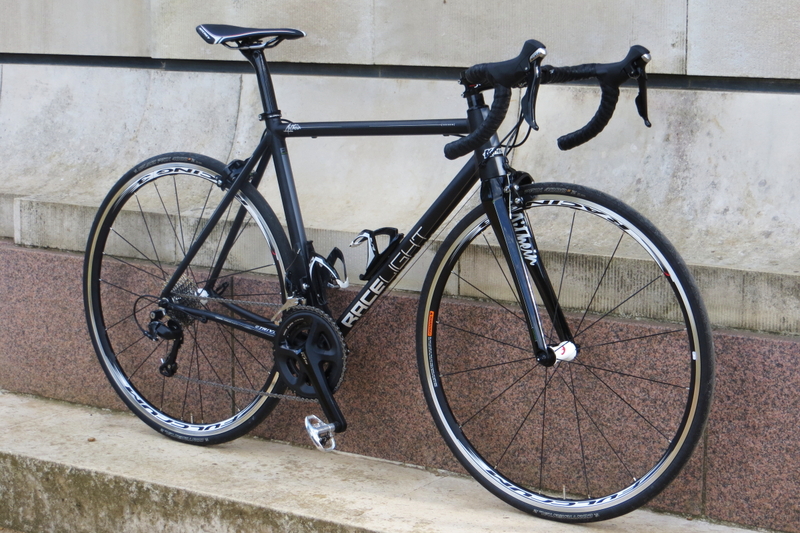 I managed to build up a road bike from a bare frameset without totally messing something up! It’s even come in slightly lighter than expected. With two bottle cages and pedals it weighs bang on 8kg (that’s 17.6 pounds in old money). 1. Installing the press-fit bottom bracket. Most sources say you need a specific BB tool to press in the bottom bracket cups, but I didn’t fancy buying one and was fairly confident I could do it at home. I rigged up a makeshift press using my bench vice with wooden supports, then slowly and carefully pressed in one cup at a time, making sure to keep everything lined up perfectly. It was actually a relatively easy task. 2. Cutting the carbon steerer. This was a little more nerve inducing! Once again there’s a specialist tool for this job but with a little patience and a steady hand it’s easily taken care of at home. I measured (more than once) and marked the steerer, wrapped some masking tape around the area and re-marked my cut line. The masking tape reduces the chance of the carbon fraying when you cut it. Using a pipe clamp as a cutting guide and a brand new hacksaw blade I carefully cut around the steerer. The result was a perfectly straight and professional looking cut! I even impressed myself with this one. I didn’t need a lot of specialist tools to complete the build, but there are some that make life a lot easier. A quality set of Allen keys are essential and a torque wrench is highly recommended, especially when working with carbon fibre components. A sturdy cycle workstand will make life a lot easier. Everything else you probably have in your garage or shed. Actually the only tool I had to buy was the new hacksaw blade. But not nearly as aero! I’d like to fit an aero-topped carbon bar, some lighter brakes and a few other little touches later on to bring it under 8kg, but it’ll do the job nicely for now! :) It’s more bike than I’ll ever be worth of anyway. Now that last point you make is an interesting one… I thought the same thing about my Venge. It started about two days after I brought it home and I realized I don’t have any more excuses – that I have one of the nicest bikes on the market (even more so with the bar and crank upgrades). Then I thought that through and decided I was worth every ounce of that carbon beauty. It’s not how fast I ride it, but that I truly love riding it. I hope you come to the same realization. You’re worth it. PS. The Venge is mighty aero. Believe it or not, I can feel the drag difference when I switch to the Trek. Deep section aero wheels. You know you want to! Oh, I will sooner or later. 50’s max though.